Where did the bombs land? 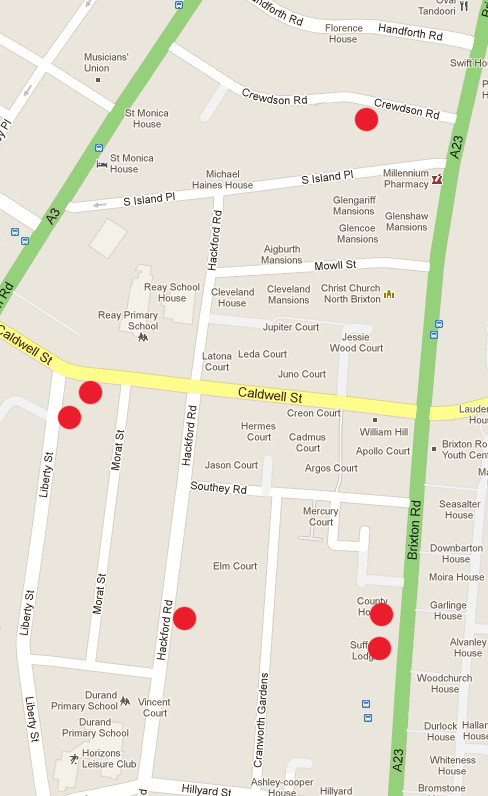 They fell all over the area - Caldwell Street, Brixton Road, Liberty Street, Crewdson Road. There are fires spread all over the area, more than the wardens can attend to. Please send AFS as soon as possible. Attend to house in 8 Caldwell Street first. 26.9.40 2:50 AM Re: our message of 02:10 hrs as for as we can ascertain all fires on our area have been extinguished. 26.09.40 6:31 AM 21 Crewdson Road between Clapham Road & Brixton Road. 20:20 PM. Incendiary Bomb. Roof top back burnt out including floor. Wardens, public extinguished this fire with much difficulty before AFS arrived. Arrival of AFS they stood by then left for depot. 26.9.40 3.59 12 Incendiary bombs have been located in this area. 8 extinguished by fire parties and wardens. 4 by A.F.S. 174 Brixton Road roof and attic badly damaged. 169 Brixton Road attic slightly damaged. 63 Hackford Road holes through roof. 26.9.40 04:00 4 persons living at No 174 Brixton Road whose house was damaged by fire are waiting at this post.